Hey, it’s tomocarl from the Sound Department. It seems that fall is the season for film festivals! Have you ever had the chance to go to a film festival before? They give you a chance to see a ton of movies at a low cost, and they also host talks with film directors and cast members, which makes these festivals an awesome bargain. 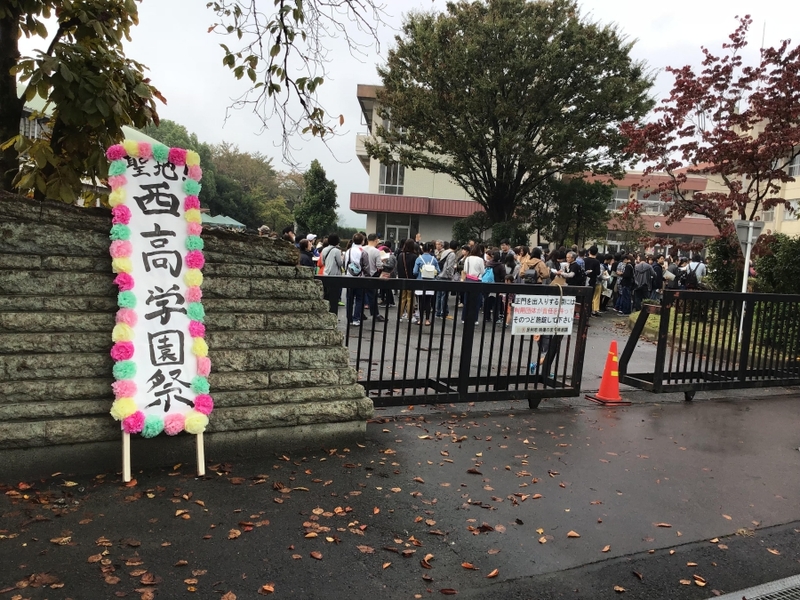 “Nishi-Ko” refers to a former high school called “Ashikaga Nishi-Koko.” The high school closed down when the city of Ashikaga was consolidated in 2009, which made the school grounds an attractive location for movie and TV productions. Along with that, the school has appeared in a number of movies, TV dramas, and music videos. This makes it a seichi, or “sacred site,” which is a term used for real-life film and anime locations that become tourist attractions for eager fans and tourists. On the day that I visited, this sacred ground brought in over 2,000 movie fans! The picture at the top of this blog post features the front entrance of the school. Despite the bad weather, there were lines of people going all the way out into the school yard. A little after I took that picture, some explosive music turned on to kick off the Nishi-Ko School Festival! The school had handmade decorations everywhere, and the traffic circle outside had food stalls for catering. The classrooms inside featured film posters and cast autographs, as well as props and costumes on display. After I checked them out,I stopped by at a cafe saw a dance performance over at the school gymnasium, then I went to catch two movie screenings. They truly captured the atmosphere of a school festival perfectly! I’m really sorry about that! There was so much people everywhere that I couldn’t take many good photos. I also signed up for the Chihayafuru guided tour which was going to start soon, so I couldn’t stay long to enjoy and photograph the rest of the dance performance. Anyway, sorry about all of that. But I’m going to get into some of what I saw during the film location tour.The film version of Chihayafuru features scenes filmed at Nishi-Ko, including classrooms, hallways, and rooftops. All of these little insider film secrets about production locations at the school were divulged by our guide, who actually works with Ashikaga’s local film promotion bureau. Our guide offered a lot of interesting tidbits about the movie throughout the tour. For instance, the opening scene with the cherry blossoms at Mizusawa High School was filmed beforehand at a different location. Also, that high-energy performance scene with the student club for karuta (a type of Japanese card game) showcased in the film, was performed with a brass band student club from one of the schools nearby. Here’s the “Mizusawa High School Karuta Clubroom” shown in the movie! The building is called Akane-so, and apparently it used to be a dining hall. They had a Q&A as the tour came to an end, so I asked about a sacred site I visited in Ashikaga before the school festival got started. The site itself is an arched bridge that shows up in Chihayafuru. I was astonished by that bit of information, and after that the guide shared some other additional hardships that came up during the production. Now that I think about it, the way that they tended to the upkeep around the school grounds was an impressive sight to see, and I would say that it really added to my overall enjoyment of the school festival.